A 1930’s art deco enamel, diamond, and 14-karat gold figural piano compact once owned by concert pianist Ellen Ballon. Gift giving used to be a much simpler task but its myriad complexities are being tackled by respected social psychologists. Motivation, perception and acceptance have all been subject to intensive scrutiny. But we can‚Äôt forget the element of fun and pleasure involved in finding the appropriate piece for that special someone, something that expresses their appreciation of history, novelty or rarity when reinvented for today. So let‚Äôs take a detour out of the ordinary and the usual same-old, same-old and venture into the realm of possibilities. Some pieces of jewellery are no longer in fashion and their original purposes now seem arcane and old-fashioned. Depending on taste and budget these subtle oddities can be celebrated for what they can be, not just for what they were. Keep your eye out for anything relatively unpopular in its current form but tweakable. You‚Äôve seen shiny CDs hung with clear fishing line decorating trees and blowing in the wind sporting rainbow colours. Jewellery can have transformations, too. 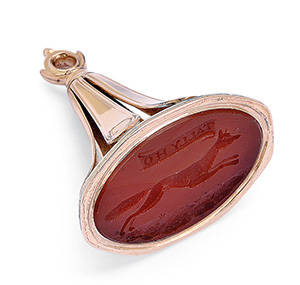 ‘Tally Ho,’ a 10-karat gold pocket watch fob seal, with hunting motif featuring a carved fox carnelian intaglio. Circa 1880s. 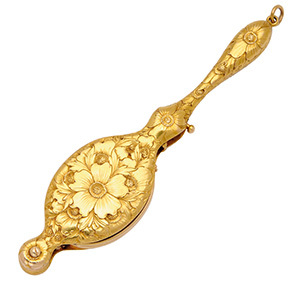 14-karat gold lorgnette with floral chased design. Circa 1920s. Powder compacts fell out of favour post-1950s with the advent of new pharmaceutical and makeup products and yet for decades prior they were a de rigueur accessory carried by every well-dressed woman of style. Made in the 1930s and designed as a grand piano, this black enamel model was once owned by Montreal pianist Ellen Ballon who made her New York debut in the early 1900s at the age of 12 but you don‚Äôt need to be a child prodigy to enjoy using it today. The figural novelty repurposes nicely as a nifty paperweight or remove the innards, the powder puff and powder screen and use the empty powder well compartment to store your favourite flavor of Chiclets-type chewing gum, healthy vitamins or OTC pain meds. 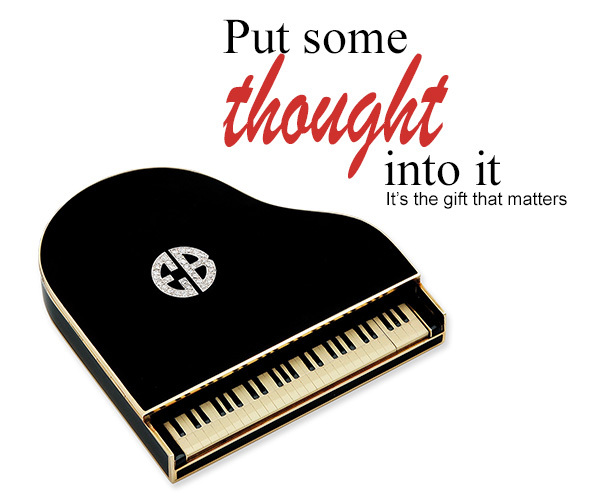 If you‚Äôre in the audience at a piano recital or jazz fest, it‚Äôll be okay for Diana Krall and Chantal Kreviazuk to covet its dark enamel beauty as the diamond-set EB monogram catches the eye. The piece is unsigned but the bonus feature is the fitted brown suede pouch stamped Black Starr & Frost-Gorham Inc., New York. Pocket watch fobs could make a great keychain ornament. Fox and dog motifs were often incised on carnelian bases such as the Victorian Tally Ho design from the 1880s – easy to find the house keys at the bottom of those capacious handbags that weigh us down, especially returning home after hunting for a bargain, or two. A graceful lorgnette can be retrofitted with replacement optical lenses, either suited for powerful magnification or prescription. The Great Gatsby‚Äôs Daisy Buchanan might have lolled on a button-tufted chaise longue gesturing languidly with her lorgnette, her other hand occupied with a refreshing bourbon splashed mint julep. F. Scott Fitzgerald described his original ‚Äúgolden girl‚Äù with the ‚Äúsilvery voice‚Äù so the yellow gold daisy chased motif is perfect for today‚Äôs movie fan who identifies with her as a heroine. Instead of heavy, odor-masking lavender oil, a favourite light floral bouquet, woodsy or citrusy scented perfume can saturate the interior cotton swatch beneath the perforated grille in a vinaigrette pendant brooch, gently wafting about one‚Äôs person. Something from Dior or perhaps Shalimar from Guerlain. The advent of modern hygiene, deoderant and copious amounts of readily available hot water does of course render the original invention moot ‚Äì the delicate sensitivities and sensibilities of the gentry no longer have to be protected from the aromas of the unwashed hordes. This fine example of a chased 14 karat gold bow brooch suspending a locket of cut-cornered rock crystal front and back probably didn‚Äôt start life together but it‚Äôs been a successful long-term marriage. Dating to the Victorian era, the Queen herself had an affinity for things Caledonian and would have approved of the motif, a Scottish thistle and English oak leaves. A 1970’s unmounted cameo plaque carved after the painting ‘Primavera’ by Sandro Bottecelli and signed by Nino Ammendola. 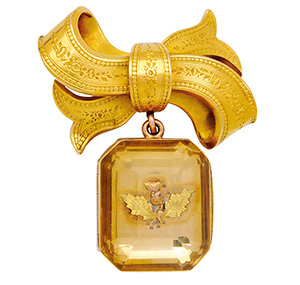 19th-century rock crystal vinaigrette pendant and bow brooch in 14-karat gold. A potential gift doesn‚Äôt have to be more than a hundred years old to look the part. 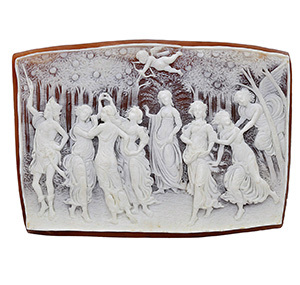 An unmounted shell cameo plaque carved with a scene depicting Botticelli‚Äôs famous portrait of Spring captures the antique style and mood but was carved in the 1970s. The Primavera design has fine detail in the folds of the draped clothing, hair and tracery in the leafy forest background plus beautiful depictions of three Graces, muses, warriors, the winged goddess Psyche and a cherubic Eros with his tiny bow and arrow. It‚Äôs 3 1/4 inches wide by 2 1/4 inches high and could perch upon a mini easel on a fireplace mantlepiece. There‚Äôs still a sizable industry in Italy, mostly located in the region of Naples, of artisans carving out fine quality cameos in classic designs such as this one signed by Nino Ammendola. Craft store staff and picture framers will share ideas for displaying items that might be more fun and interesting to hang on your walls rather than body. Framed shadow boxes from Michaels or Ikea are made even more useful with those practical jeweller‚Äôs double pins. If you keep your giftware selection general, anything and everything can fit the novelty category. It‚Äôs a useful philosophy to practice and it‚Äôs extremely useful since the non-pigeon-hole category expands infinitely. Not everything has to live up to its official designation. Change it up and charge it up. Add it to your gift giving wish list. That list is infinitely changeable.